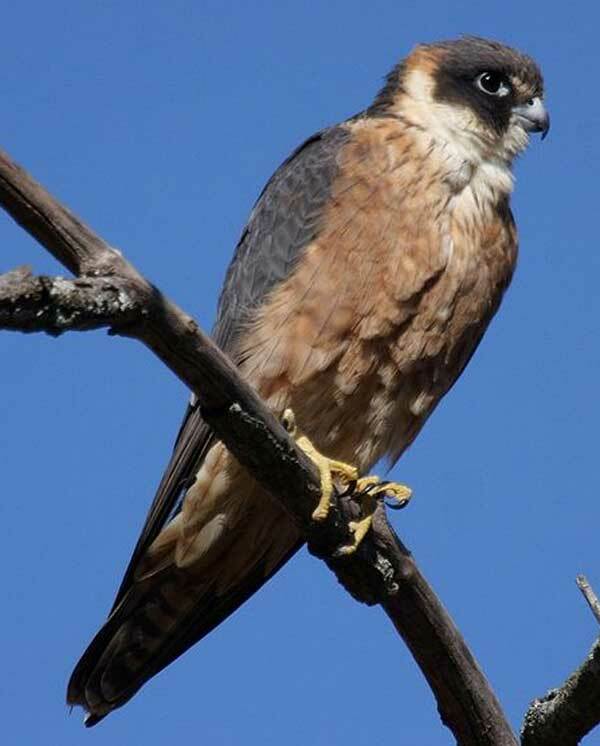 The Australian Hobby or Little Falcon (Falco longipennis) is a falcon found mainly in Australia. It is also a winter migrant to Indonesia and New Guinea. It is one of Australia's smallest raptors and is about 30-36 cm long. It strongly resembles the Peregrine Falcon, however it is much smaller and has darker plumage. It inhabits open woodlands where it manoeuvres swiftly through the foliage in chase of other birds. It is very adaptable and will visit urban parks and gardens, and remnant bushland. They will hunt small birds, up to nearly their own size, and are often seen at dusk hunting bats and large insects. When breeding it takes over nests of other birds. The female incubates and broods young while the male hunts. It gets its scientific name from its narrow long-flighted wings.